There Is No Such Thing As A “B-Grade” Movie – Schlockmania! One of the beauties of writing about cult cinema is the freedom you have in describing the experience to others: it’s not taken as seriously as mainstream cinema so fans and critics have a lot of latitude when it comes to how they choose to define and explain their cinematic experiences. Unfortunately, the lack of well-defined rules on discussing this subject also leads to a certain amount of clichés that have become widespread in cult-film circles. Sometimes these descriptive terms filter back to the mainstream, where they become truly annoying to any seasoned cult film professional. A good example is the use of “cheesy” as a go-to adjective for describing any pop culture artifact that is either strange or doesn’t work the way it is intended to. There is no direct connection between this adjective and what it aims to describe. It doesn’t tell you anything about the work in question other than the person using this word is looking down their nose at it and the lack the descriptive ability to explain why. Thus, they fall back on a nebulous term that offers an easy form of mental shorthand to the similar-minded. There are plenty of better, more illuminating word choices you could use but, let’s face it, most people are lazy. Especially when it comes to subjects they consider frivolous. That said, there is one hyphenated expression often thrown out to describe a certain section of cult movies that is worse than a cliché – it’s just flat-out wrong. The descriptive term I’m referring to is either “B-grade” or “grade-B”. This expression is rooted in either cultural misunderstanding or mental laziness, depending on who is using it. When people say this, what they are really trying to say is simply “b-movie.” That is a legitimate cinematic description with an actual history – and explaining its meaning will shed some light on the “b-movie”/”B-grade” confusion. The term “b-movie” refers to the film that occupies the second half of the bill on a double feature. This dates back to the studio system era when going to the movies was a cheap pastime and studios would give viewers plenty of product to keep them coming back to the theaters week after week. The double feature was the most common way of releasing movies for both major studios and independents. The “a-movie” was usually the main attraction and the more expensive of the two films on the bill. The “b-movie” was usually made quickly and inexpensively to flesh out the expected double bill. Making b-movies quickly became a widespread practice at both major and indie levels of the business: the major studios could use them to maximize their investment in facilities while testing out new talent in a low-risk way and smaller studios and indies focusing exclusively on making b-movies to carve out their own less-expensive niche in the business. Unfortunately, “b-movie” became a word that people often throw around without learning what it means, instead guessing at its meaning by the context in which it is used. 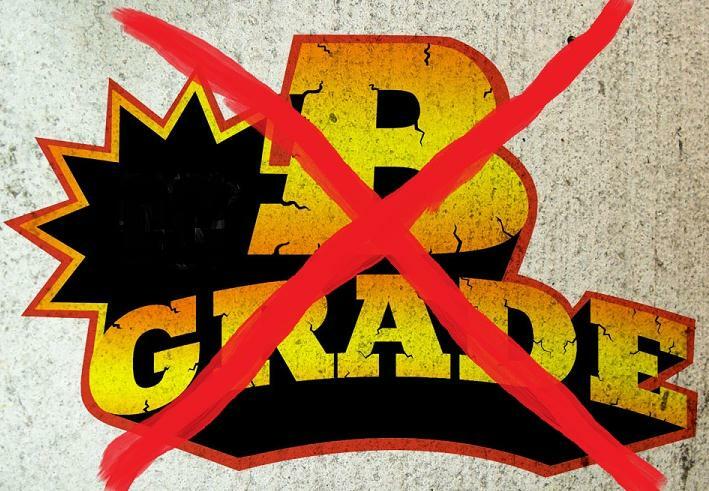 This has led to a lot of people – including people who genuinely like these movies – wrongly referring to them as “B-grade”/”grade-B.” Not only is this historically incorrect, it’s shortsighted if you take its meaning at face value. Think about it: if a movie was to be assigned the grade of “B,” that’s not too bad of a grade. How often do you see a movie that actually earns an “A”-level rating in the minds of most people? Considering the large amount of junk cranked out by the major studios each year, most of their output would qualify for a “C” or worse. If you call a movie “B-grade” because it was made cheaply, you’re still wrong. This means you define the quality of a movie by how much was spent on its production and that’s a stunningly ignorant yardstick for judging the quality of entertainment. Does this mean that the Transformers movies are A-grade and a low-budget but extremely influential film like Night Of The Living Dead has to settle for a B-grade simply because of the money involved? Plenty of film historians would be willing to argue that point. If you use “B-grade” to refer to a film with weak storytelling or acting, those criteria could apply to plenty of “A-movies” as well (again, consider the Transformers example). In short, if you describe a movie a “B-grade”/”grade-B,” you are using a term that is as inaccurate as it is imprecise. Either use “b-movie” or, better yet, use a combination of creativity and research to come up with something better. There is a big, colorful lexicon out there full of terms waiting for people to use them inventively. This goes double for those of you who actually like these movies so much that you want to write about them… after all, haven’t our beloved b-movies already been disrespected enough? Thanks – and “cult movie” is indeed a dangerous expression. ,Excellent essay there,for it’s interesting in knowing that the once-popular term “B Grade” movie(that was so commonplace in the 70s and 80s) has now been replaced with words such as “grindhouse”,”drive-in”,”cheesy”,and “throwback”(the most overused[and super annoying] term in the 00s/2000s),and you’re right about how people used to carelessly throw that “B grade” term around(around 25 to 30 years ago) like everyone is now doing with those other modern terms(that have replaced it[in the on-line fandom world]). Thanks, Steven. And yeah, “grindhouse” is one of the most-abused/misused modern terms in the genre movie world.